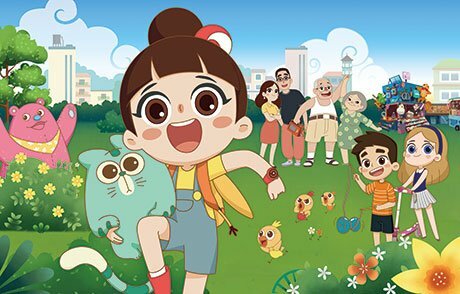 Viacom-owned UK terrestrial net Channel 5 has picked up animated preschool series Luo Bao Bei for its morning kids’ block Milkshake. The 52×11’ series has been acquired from Ireland’s 9 Story Distribution International and will premiere on May 7. The show is written by British scribe Dave Ingham (Shaun the Sheep, Octonauts) and the UK version will feature the voice of TV presenter and fashion expert Gok Wan as Luo Bao Bei’s father. Produced by Magic Mall Entertainment, Luo Bao Bei was created by Grace Tian, with Cardiff-based Cloth Cat Animation commissioned for the animation. 9 Story holds global distribution and merchandising rights, excluding China. The programme was also recently acquired by ABC in Australia and E Junior in the United Arab Emirates. The show follows Luo Bao Bei, a bright and spirited seven-year-old girl with a vivid imagination, on a quest to understand the world around her.